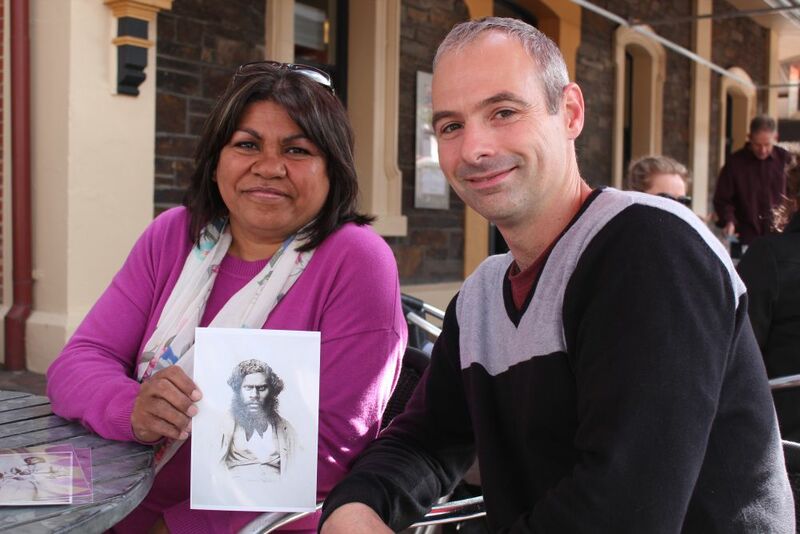 Image: Lynnette Wanganeen with Dr Chris Morton and copy of an 1867 photograph of her ancestor. Image courtesy: Pauline Cockrill and History SA. Family portraits are valued items that give us a unique snapshot of a moment in time and through those image memories that can be cherished for years to come. Such images can also become an important historical record. But not everyone in the community has access to such images and there may be pieces of one’s past that are unknown due to a loss of photographs, which also becomes a gap in the historical records. Trying to obtain images from previous generations can be difficult, but one researcher is doing all she can to use the past to change the future. Professor Jane Lydon, an ARC Future Fellow and the new Wesfarmers Chair of Australian History at the University of Western Australia, wants to establish visual history as a key aspect of Australian and Indigenous historiography. Professor Lydon is using her Fellowship to reverse the previous flow of a significant heritage resource of Indigenous Australians to European collections, and to make those precious documents available to the communities, relatives and descendants of the Aboriginal people in the photographs. “To do this we need to return those images—which are often in museum collections held overseas in Europe, having been collected by European explorers from the mid-nineteenth century—to Australia and to the descendants of the people in the photographs,” Professor Lydon said. Professor Lydon has had great success with her research under her Future Fellowship. In December 2012 Professor Lydon published The Flash of Recognition: Photography and the Emergence of Indigenous Rights. The book presents a new way of looking at the relations between Aboriginal people and settler society in the past through visual imagery. “What I’ve argued in that book is that images were an important way of campaigning on behalf of Aboriginal people, both up until the 1930s as used by white activists and then from the 1930s on as used very much by Aboriginal people themselves to argue for their rights,” Professor Lydon said. This dedication to her research field was recently rewarded at the 2013 Queensland Literary Awards where Professor Lydon won the history book category. It’s not the only one of Professor Lydon’s books to receive high recognition. Fantastic Dreaming: The archaeology of an Aboriginal mission (AltaMira, 2009), won the Australian Archaeological Association’s John Mulvaney Book Award in 2010. She is now working on a new book looking at how photographs have played a role in shaping ideas of what it means to be human. The book will be international in its scope, but will be framed through the lens of race relations in Australia and the way that Aboriginal people have been represented by photographers and have represented themselves. Her research will also be developed further by a six-month visiting fellowship to Cambridge University this year, enabled by her Future Fellowship. Another achievement has been the collating of a database that brings together images from four overseas collections in the UK, Netherlands and France. This will be an important resource to establish which images held overseas relate to which communities here in Australia. It will also serve as an important tool for returning those images. This collaborative work has led to strong links with the renowned Pitt Rivers Museum in Oxford, UK. In August last year Dr Christopher Morton, Curator of Photograph and Manuscript Collections at the Pitt Rivers Museum, who is working with Professor Lydon on her research project, visited Australia presenting a public lecture Searching for Wanamuchoo—Researching and returning Aboriginal photographs from the Pitt Rivers Museum. This lecture highlighted the importance of Professor Lydon’s research project in exploring visual histories held in remote photograph collections such as Oxford, the ways in which it has attempted to reconnect the images to relevant indigenous communities today, and the research and curatorial issues that have emerged. While in Australia, Dr Morton was fortunate to be introduced to a descendant of one of the early Aboriginal portraits in the Museum’s collection. The portrait in question is of James Wanganeen, an Aboriginal member of Poonindie Mission in Port Lincoln, South Australia, and his descendent is Lynnette Wanganeen (James’s great great great granddaughter). Dr Morton was delighted to be able to present Lynnette with a print of this portrait, as well as one of James with his third wife, Mary Jane. “The presentation of the copy of the PRM portrait was a very emotional moment for Lynnette, who felt a close bond to James despite the generational distance,” Dr Morton said. “She spoke of the importance of seeing James and having a copy of his portrait, and for me it was a transformational moment also, in that I had known this portrait for many years, pasted onto a mount with maybe twenty or more other portraits. It is these precious moments that make Professor Lydon’s research even more rewarding and she has a very clear picture of what she wants to achieve in the future. “In a broad sense I’m hoping that a research outcome of my Future Fellowship will be establishing visual history as an important field of research and visual archives and photographs as an important heritage resource, particularly for Indigenous communities. “I want to help the Australian public to become more conscious of the legacies of the past in the present. I’m hoping the books will also have an impact on Australian history and heritage. “We all want to be acknowledged for our intellectual contribution to research, but I’d also like to be thought of as someone who tried very hard to mentor and collaborate with Indigenous people. “I’d like to draw more Aboriginal people into academia and bring them into the field as researchers of their own past and their own heritage,” Professor Lydon said. For more information please contact Professor Jane Lydon. ← The Return of Photographs – what does it mean for Aboriginal people?